Ayr’s final Saturday meeting of 2014, the John Smith’s Raceday last weekend, was dominated by veteran jockey Brian Harding, who rode a treble. Brian, enjoying a bumper season, set the ball rolling on Top Billing (3/1) in the Plumbstore Handicap for local owner Doreen McGawn, then scored on 9/1 chance Fisher for trainer John Quinn in the John Smith’s Extra Smooth Handicap Hurdle, and finally completed the hat trick on Another Bill (3/1) in the national hunt flat race. Top Billing and Another Bill were both trained by Nicky Richards. Cumbrian based trainer Martin Todhunter and jockey Wilson Renwick teamed up for Presenting Junior (11/10 fav) (pictured above left) to win the John Smith’s Handicap Chase. The feature race, the John Smith’s No Nonsense Handicap Chase, was won by Definite Dream, in the hands of jockey Paul Moloney, from the Vale of Glamorgan stables of trainer Evan Williams. 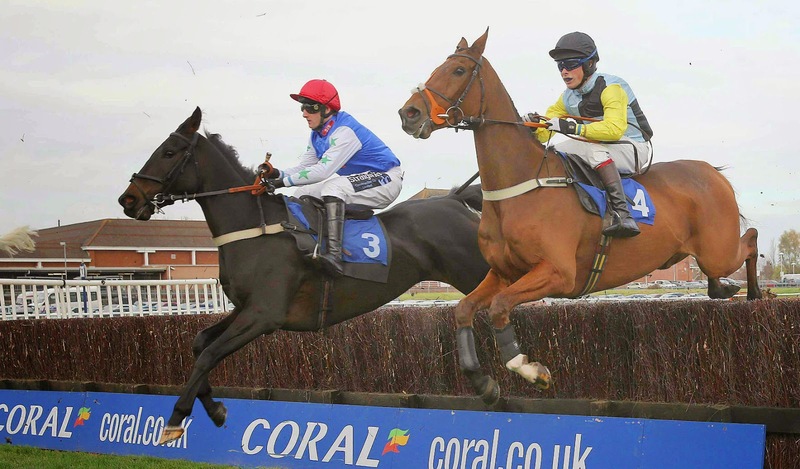 AYR Racecourse’s next fixture is Heroes Raceday on Wednesday 12 November. The seven race card is due off at 12.50pm with the Betvictor.com Maiden Hurdle over two miles four furlongs and the final race is at 3.50pm. The joint feature races of the afternoon are a Handicap Chase and a Novice Handicap Chase both over three miles one furlong.